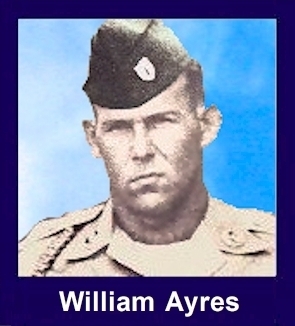 The 35th Infantry Regiment Association salutes our fallen brother, SP4 William Francis Ayres, who died in the service of his country on February 27th, 1966 in Darlac Province, Vietnam. The cause of death was listed as Grenade Accident. At the time of his death William was 27 years of age. He was from New Gretna, New Jersey. William is honored on the Vietnam Veterans Memorial at Panel 05E, Line 82. The decorations earned by SP4 William Francis Ayres include: the Combat Infantryman Badge, the Air Medal, the National Defense Service Medal, the Vietnam Service Medal, the Vietnam Campaign Medal and the Vietnam Cross of Gallantry with Palm Unit Citation. A military funeral will be held tomorrow at 2 P.M. for a New Gretna soldier killed in Viet Nam on Feb. 27 when a hand grenade accidentally exploded. Spec. 4 William F. Ayres Jr., son of Mrs. Edna Kirck of Hillside Ave. New Gretna, was serving in Viet Nam with Co. A First Battn. 35th Infantry Regt. 25th Infantry Div. since last August. At that time, Ayres was wounded when his helicopter was shot down by enemy fire. He sustained a broken arm, broken ribs, and a broken leg and was hospitalized in the Phillipines for two months. He was later transferred to Hawaii, home base of the 25th Infantry Div. and was in the hospital until mid December. The soldier was reassigned to his unit in Viet Nam just before Christmas. The last letter received by Mrs. Kirck was dated Feb. 21. Ayres wrote: I'm coming home on leave in nine months. Ayres was born in Bellmawr and attended school there. His family later moved to New Gretna in 1965. Ayres father, William F. Ayres Sr., is deceased. His step-father, Albert Kirck, is employed at the Atlantis Golf Course, Tuckerton. Other survivors include two brothers, Edward of New Gretna and Frank of Westville. Funeral arrangements are under the direction of the Woods Funeral Home, Tuckerton where friends may call this evening, 7 to 9 P.M. Burial will be in the Hillside Avenue Cemetery. Ayres served a total of seven years in the army. During his first enlistment he served with the First Cavalry Div. in Korea. He later was a member of the National Guard Unit in Tuckerton. And subsequently served in West Berlin for a time. The family indicated details of Ayres death are lacking other than the telegram received from the Defense Department. Ayres was the fifth soldier from Burlington County killed in Viet Nam in the past three months. William is buried in Hillside Cemetery just East of New Gretna. New Gretna is located on Rt. 9, five or six miles west of exit # 50 of the Garden State Parkway (East Central New Jersey). The cemetery is located off of the intersection of Hillside Lane and Old New York Rd. Old New York Road intersects Rt. 9 about 2 miles east of New Gretna. Turn south (left if headed towards New Gretna or right if headed back towards Garden State Parkway) on Old New York Rd and go about 3-5 miles to intersection with Hillside lane. Turn left on Hillside Lane and cemetery is a quarter mile on the right. The grave marker is about 3/4th back on the right side entrance.